Jones tubes – what are they, how do they work and what's the right tube for you? Jones tubes are small tubes that create a new channel for draining the tears. They create a bypass route of tear drainage when the normal tear ducts fail and alternative techniques to provide drainage are not possible. When are Jones tubes used? Jones tubes are used to correct watering of the eye when the normal tear ducts become blocked or stop working and can't be restored. 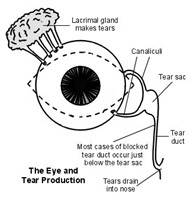 Tears are produced by the lacrimal gland and pass over the surface of the eye towards the nose where they enter the tear drainage system. Normally they pass first into two small openings called puncti, one in the upper and one in the lower lid. These lead into narrow horizontal passages called canaliculi which pass towards the nose where they join and enter a larger section called the nasolacrimal sac. This runs vertically downwards to form the nasolacrimal duct which passes through a bony channel and enters the nose. So tears eventually drain to the nose, explaining why your nose tends to run when you cry. Blockage of the tear ducts causes watering from the eye. Tears build up on the eye and may blur vision. They tend to run down onto the cheek often making the skin sore and most people find they need to constantly dab the eye to remove the excess tears. The eye may also be sticky and more prone to infections. Blockage of the tear drainage system can occur at any point from the entrances of the tear ducts through to the opening into the nose. The most common sites of obstruction are within the nasolacrimal duct and at the punctal openings. Nasolacrimal duct obstruction is treated with a procedure known as a DCR (dacryocystorhinostomy) with a high success rate (approximately 90%). Punctal obstruction can also usually be corrected with a small procedure known as a punctoplasty. Obstruction of the canaliculi is less common. It may follow trauma, eye infections, previous tear duct or adjacent surgery, certain eye drops or medication, radiotherapy and several other rarer eye conditions. Occasionally this part of the tear drainage system does not form properly and is not present at birth. The canaliculi are very narrow channels (approximately 1mm) and surgery to open them is frequently unsuccessful. As a result an alternative means of draining the tears is needed. Obstruction, absence or loss of the canaliculi are therefore the main indications for a Jones tube. A Jones tube may also be needed following a DCR procedure where the new channel is open but fails to drain the tears and occasionally where the normal eyelid blinking mechanism that pumps the tears down the tear duct is lost as in a weakness of the eyelid muscles. How does a Jones tube work? Jones tubes act as small drain pipes that run from the inner corner of the eye into the nose. They provide a new channel for the tears to drain, essentially bypassing the blockage to restore tear drainage and for this reason are sometimes known as bypass tubes. Why should I have a Jones tube? You should consider having a Jones tube if you have troublesome watering where the failure of tear drainage can't be corrected by other techniques. What happens if I don't have a Jones tube? Without a drainage mechanism the eye will continue to water. Although there is probably a slightly higher risk of eye infections a blocked tear duct is unlikely to be a danger to your eye. Nevertheless most people find the constant running of the eye a significant problem: the blurring of vision, the need for constant dabbing of the tears, the effect on the eyelid skin and frequently the social impact of other people thinking they are upset or crying are reasons why people decide to have surgery. How is a Jones tubes put in? Surgery is needed to put a Jones tube in using a procedure known as a conjunctivodacryocystorhinostomy. In many cases an attempt will already have been made to open the natural tear ducts at a previous operation. Sometimes it will be clear at the first operation that a Jones tube is needed. A new opening is created between the inner corner of the eye and the inside of the nose and the tube is placed in this channel. As each patient's anatomy is different a range of tube sizes is available to allow fitting to each individual . The length of the tube is usually about 11-16mm long. The entrance to the tube is positioned to collect the tears in the inner corner of the eye and the inner end of the tube is arranged to drain the tears freely inside the nose. Sometimes surgery requires a small cut in the skin on the side of the nose to allow access to the tear duct system. Often the surgery can be carried out from inside the nose which avoids any skin incision. A suture is usually placed around the end of the tube and tied to the skin for the first 1-3 weeks to hold the tube in place. The surgery takes about 30-45 minutes and is normally carried out under a general anaesthetic, though a local anaesthetic can be used. It's usually possible for the surgery to be carried out as a day case procedure and time off work is usually around one week. Who puts Jones tubes in? Surgery to place Jones tubes should be carried out only by surgeons experienced in lacrimal surgery. This will normally be specialist ophthalmologists known as oculoplastic or ophthalmic plastic and reconstructive surgeons who have a special interest in problems with tear duct and related areas. A number of specialist societies exist which have lists of appropriate surgeons, see for example www.BOPSS.co.uk, www.ESOPRS.eu and www.ASOPRS.org. What are Jones tubes made from? Eye surgeon Dr Lester Jones developed the Jones tube in 1961 in conjunction with Gunther Weiss glass-blowers. He was looking for a means of correcting obstruction of the canaliculi using a suitable tubular stent that was capable of draining the tears to the nose. They struck upon the idea of using glass as the stent material not only because it's an inert material that generates no significant tissue reaction but also because of its unique property of capillarity. Glass actively attracts water; a narrow glass tube with one end in water draws water up inside it to a level higher than the water level outside. A tear drain made of glass would therefore actively attract the tears and assist drainage. Glass Jones tubes have stood the test of time. Other materials such as plastic and silicone have also been tried but lack the benefits of glass and are generally less effective and associated with greater complications. How does a Jones tube remain in place? Although initially it was hoped that the channel might remain open if the tube was later removed in practice it usually quickly closes over once the tube is removed and the tube is therefore intended to be a permanent drain. One of the greatest challenges with Jones tubes has been in ensuring that they remain in their correct place, able to drain the tears. The tubes have an enlarged, funnel-shaped flange at the end that rests in the inner corner of the eye. This picks up the tears and also prevents the tube slipping in towards the nose. To facilitate placing the tube the inner end however has not been enlarged, or at most has had a small flaring of the tip of the tube. There has been little to prevent the tube falling out and indeed loss of the tube through falling out has been the most common complication. Over the years a number of changes have been tried to prevent this. For example the tubes have been made angled or curved or with an expanded middle portion . However these are more difficult to position, tend to be longer and are harder to clean. A roughened 'frosted' surface has been applied to the tube (Frosted Jones tubes, Gunther Weiss) to try to provide extra grip in the channel the tube rests in, but this has not reduced the tendency for the tubes to fall out. A coating of porous polyethylene has been added to part of the outer wall of the tube (Medpor-coated Jones tubes, Porex) to try to bond the tube to the surrounding tissues but this approach led to additional complications and these tubes are being discontinued. More recently a flexible silicone internal flange has been added to the tube (StopLoss Jones tubes, LJT Surgical Ltd) and this finally appears to have prevented the problem of the tube falling out. How successful are Jones tubes and what complications can occur? Well-positioned Jones tubes are very effective at draining the tears; they prevent watering from the eye in almost all cases. Patient satisfaction with their tube is around 90%. Most patients who have had a tube fall out or need replacing elect to undergo further surgery to replace it rather than put up with a watering eye. A number of complications have however been seen. Until recently falling out (extrusion) of the tube has been the most frequently seen complication with over half falling out within a few years and eventually almost all are lost. Because the track usually closes quickly once the tube is removed in most cases further surgery is needed to replace these tubes. The StopLoss tube appears to prevent this complication with a 0% extrusion rate to date. Obstruction of the tube – through tissue overgrowth or migration of the tube towards the nose. Further surgery is frequently required is this occurs. Air and mucus regurgitation – the tube can allow air or mucus to pass from the nose to the eye when blowing the nose or sneezing. Persistent watering from the eye – if not blocked this may indicate the tube is not correctly positioned. Discomfort – occasionally irritation in the inner corner of the eye occurs, but significant discomfort is not common. Discharge from the nose – uncommon. Dry eye – uncommon, may indicate an additional problem on the eyelids or surface of the eye. Cosmetic concerns – only the outer flange of the tube is visible. It's small and being glass is usually difficult to spot. Significant cosmetic concerns are rare. Double vision – very rare. How do I look after my Jones tube? To maintain full function Jones tubes do require some maintenance. It is recommended that each day some clean, warm water is drawn through the tube in a shower or bath by pinching the nose and 'sniffing' some of the water on the eye down the tube. If mucus accumulates at the external end of the tube this can be carefully cleaned with a cotton tip. Every 6-12 months your surgeon may also need to check the tube position and clean the internal surface or occasionally remove and replace the tube in the clinic. Previously it was essential that the eyelids were closed tightly or a finger placed over the corner of the eye when sneezing or blowing the nose to prevent the tube being blown out from its channel and lost. Because it prevents extrusion this is no longer a requirement when a patient is fitted with a StopLoss Jones tube.